As these economic times get tougher and tougher for debtors, I am confronted on a weekly and sometimes daily basis regarding their plight. In the most recent case, a debtor was having a difficult time making his rent payment and was concerned about being evicted. He then remembered that he had hired an attorney four months earlier to help him get out of debt. Well it turns out that the debtor has never complied with the pre-filing requirements, has never returned the prepared petition, and has sat idly by, hoping and praying that just by hiring a bankruptcy attorney the debt would be eliminated. Of course this is not how the bankruptcy system works. The debtor mistakenly believed that the down payment made to the attorney were simply funds in an account that he can tap into or pull from if needed. He failed to take into consideration the executed retainer agreement which in part governs the relationship between the debtor and his attorney. The debtor did not factor in the time, effort, expertise and staff work related to the preparation of his bankruptcy petition including administrative file set up and billing. He simply figured that since the case was not yet filed, then he can decide not to file and receive a full refund. Now this may be the case with an item that one purchased at a retail store, never used, saved the receipt, and within a reasonable amount of time decided to return. In such cases, the merchant has the ability to restock that item and resell it to someone who is desirous of it. When it comes to legal services performed, there is no restocking ability. Each case is particular. Each case must be prepared by the staff, attorney, reviewed and sent out for signature. This is time, labor, and expertise that could not be returned back to the provider. the interim of hiring the law firm and completing the long payment plan, the debtor purchased a piece of property that has significant equity. The debtor claims that he only purchased the property for $3000 and that it did not have adequate plumbing and that it was not technically habitable. However, other homes in that neighborhood and on that very same block are valued at 35,000 all the way up to 60,000. Since the debtor decided to make a purchase between the time of hiring the law firm and the time of filing, the debtor has effectively knocked himself out of the relief offered by chapter 7. This debtor was wondering why he could not receive the full amount of his payment plan because he was not actually filing anymore. This debtor failed to realize that everything was completed and prepared with his case, including a two year payment plan, but could not be filed due to the debtor’s own actions. The take away from this article is that debtors must be aware that they are contracting for legal services. Legal services are not a product that can be restocked and resold to the next person interested in the service. Legal services involve time, energy, expertise, care and personal attention to the very details of the particular debtor’s case. For that reason, most debtors’ attorneys will offer limited refunds or partial refunds in certain specific instances. When you hire a bankruptcy attorney, make sure that you know and understand the agreement that you have entered into. Bankruptcy attorneys are some of the most helpful attorneys that one can find. They have chosen that facet of the law because it provides the greatest amount of financial relief to someone struggling with debt. 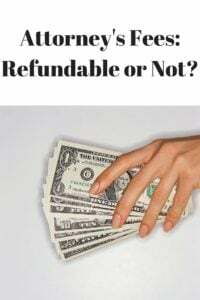 Before you demand a refund simply because your case was not actually filed, take into consideration what effort was put into your case by your attorney. I guarantee you that it was not just filling out some simple forms for your signature.